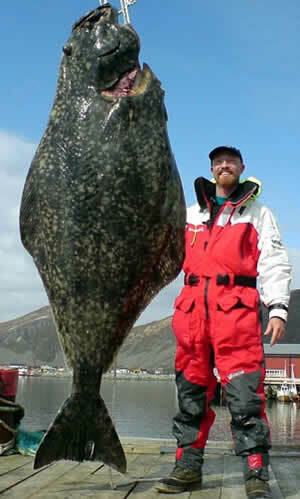 LOFOTEN, Norway -- A halibut thought to be the largest ever line-caught fish has been hooked by an angler in Norway. The 444 pounds creature, which measures 8 foot 1 inch long, was landed by proud fisherman Soren Bec following a titanic struggle. The monster catch is believed to have beaten the previous record for a line-caught fish by 24 pounds. Although halibut of up to 8 foot have been spotted in Norweigian waters, it is unusual for the fish to grow to their maximum size without being caught. Halibut are the largest flat fish in the ocean, with an average weight of 25 pound to 30 pounds, and can be found in the North Pacific and North Atlantic oceans. 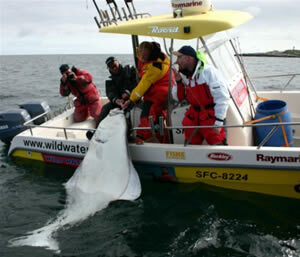 Cato Bekkevold, an expert from the region, said: "The area where he caught it is famed for cod and coalfish, but last year the Wildwater Camps brought up 80 halibut. "These halibut can be caught by a variety of methods, but drifting with coalfish or big shad-jigs [a type of hook] baited with a worm have caught the majority. "There have been some monsters caught by commercial fishermen, with one recently off Norway weighing 314.5kg (693 pounds). "The biggest in recent times was 329kg (725 pounds) caught in the late 90s, and the biggest ever recorded is around 400kg (882 pounds). "It is painted in full size at the Halibut museum on the island of Senja." Why was this fish killed? To make a pointless record? By killing huge fish like this you are eliminating a genetic breeding resource thus denigrating the genetic pool for this species. The fishermen and hunters of this world need to stop going after record species and focus on midsized fish. Most likely it was food. if people never caught record fish or animals we would never truly know the record. Good job guys, thats a heck of a catch. What a beast! I wish I had caught that one. Nice haul for a line caught fish. A record in fact. I am sure there are bigger ones out there still. Maybe I will be the one to catch it? I fish for halibut every year, and the average weight for my catches varies from 20-30 lbs, but on occasion I will catch a whopper over 100lbs. To comment on Mr. Gray, fish this size are known to do more harm than good...they need more food to sustain life thus depleting the "staple" fish in the area these men were originally angling for; and if the gemtleman that caught this monster does not smoke every ounce of this halibut, then that is just wrong and your argument is just. But please do not assume these men were out there fishing for a record. A majority of records are broken by accident. My case in point...back in 1986, just a year after the current record King Salmon was caught by Mr. Les Anderson (~98 lbs) I landed a 92 lb King Salmon on the Russian River. I used every ounce of that fish...from the meat (steaks, yummy), to her eggs for bait. To close, Mr. Soren Bec will more than likely put the fish to good use...he is just relishing in the moment of a once in a lifetime achievement. It is a very big fish.I like fishing. This guy do Cristal tecnic before and after this "Hunt". Because this he was a suscefull guy just because The Cristal Tecnic from Mrs Mysley from Dubay Cristal Fishing Academy!